Did you ever see one of those commercials where they put a car through the changing, violent weather test to see how the finish holds up? You are looking at the human version of that car. Do you see Mickey Mouse in the clouds, too? Sunday at Silver Glenn, a beautiful spring on the St. Johns River, broiled in 93 degree heat (more in direct sun where we were), but the water was cool as a glass of iced tea. That is where my son’s and a friend’s family and I spent most of the day. The clouds were billowing and beautiful all day. Since I am surrounded by trees, and see only a pinch of sky to the southeast, the view was a real treat. “They do look like thunderheads,” I told my son, but he assured me there was a zero percent chance of rain for the day. You know what’s coming, don’t you? Traveling back down the river to our ramp, the clouds darkened more and more until BAM! We began to be pelted in the face with raindrops like buckshot. The temperature seemed to drop thirty degrees in minutes and the towels drawn around to protect our bodies had to be rung out every five minutes. “At least there is no lightn—-“I said just as the sky began to rumble. Time to pull over, but not too close to the trees. After a time, we slowly moved our way along, with the rain still coming down in bullets. Minutes before we turned into the dock, the sun came out. At least we wouldn’t have to pull out the boat in the storm. In His defense, I must note, we saw three rainbows as we inched out of the treacherous monsoon. Noah may have fallen for that apology, but we weren’t quite ready. And no, I didn’t get pictures of them. I had stashed my camera in a dry spot seconds before the deluge. POSTSCRIPT: First trip on the St. Johns that we have seen not one alligator. Also there were few birds, save a few anhingas and cormorants, unless you count the flock of turkey vultures making themselves at home in the park. Our excellent Otter Spotter, H-2’s cousin spied one of those for us and a couple of turtles. I believe the wildlife decided they will come out when October REALLY gets here. Can it be I have been writing this blog since September 3, 2006? Doesn’t seem like it, but the evidence is there. I started not know where or when it would end and I still don’t. It would be hard to pull away from the wonderful, eclectic group of blogger buddies I’ve met through this post, Amuirin, Corina, Ben, Chris, Robin, Lea, Tabbie, Carson, and on an on. I hesitated to begin naming because I know I will delete some of my favorites, but you know who you are. If only my brain were as sharp as it had to be in the picture above from 1957 — not 2006. Don’t want anyone to think I descended the mountain in Shangri La sometime in the last three years. By the way, that’s a Burroughs bookkeeping machine. Thank God for tiny computers with electric keyboards. What I am really trying to say (badly) is thank all of you who read, encourage and challenge me for sticking around. You make it all worthwhile. Tell me this doesn’t look like a snake. After climbing a low-hanging branch. The pattern is clear now. Every time I grab the camera to capture a shot, something else moves into the scene, invariably an even better visual catch. Yesterday was a close match as to what was best. I have watched for the Hooded Merganser duck to return for the second year. As I got out of the car yesterday, I spotted a hen and drake down at the pond. So I run for the camera and snap away at the shy fowls. As you can see, they do not make it easy to get a good shot. So I waited and waited, hoping they might venture closer. Suddenly a snake surfaced too close them and startled me. 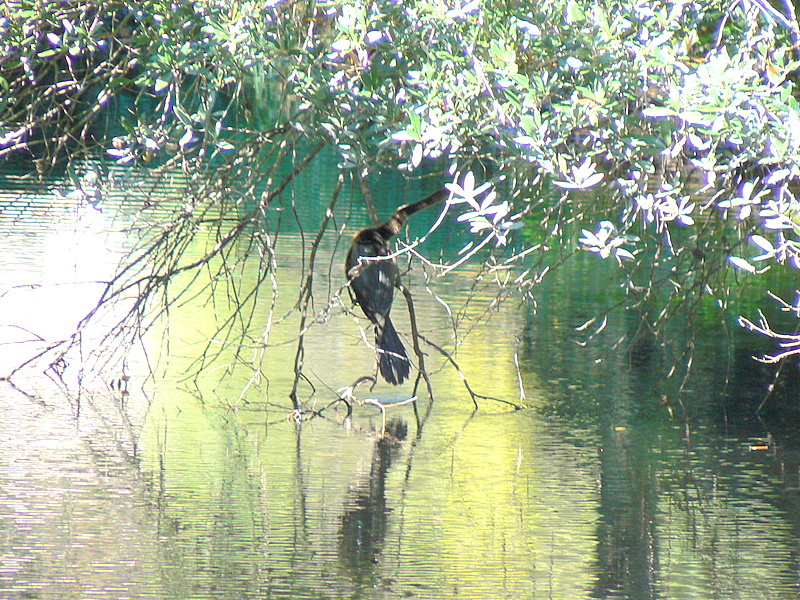 It took only another second to realize that it was not a snake, but a Snakebird—an anhinga! This is prize I have been waiting for. 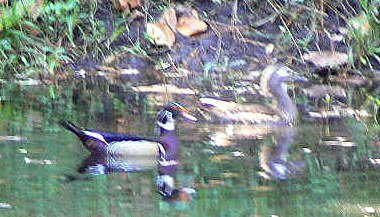 Only once before has an anhinga visited the pond and my camera shots were not good. I camped out this time. The results you see here. I still wait for that wonderful close-up of the bird drying his fully outstretched wings. (Anhingas do not have the oil glands necessary to shed water like other water birds, so they must “hang them out to dry in the sun.”) Their territory is the Atlantic and Gulf costs from North Carolina to Texas and in the Mississippi Valley north to Arkansas and Tennessee and south to South America. You may have guessed this species is my favorite.